Good afternoon from Huntington Beach everyone! If you saw some of my Tweets & Facebook updates over the past week, then you probably will remember me mentioning that I was going to be doing an “Extreme Maternity Shoot” yesterday. Well…. yesterday has come & past and all I can say is that the maternity shoot was taken to the “HNL” (Ho Nuthah Leveh!). Back in October of 2009, I had the honour of photographing Anna Marie and Lee for their Los Olivos Wedding at the Firestone Vineyard up by Solvang. 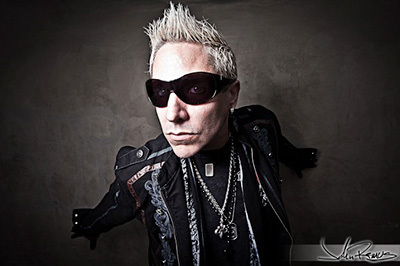 It was absolutely fantastic and was even featured in Professional Photographer Magazine from the PPA. In fact… their wedding photography was so incredible that I even used a beautiful portrait for my current Two-Page Ad in Ceremony Magazine. It’s absolutely to die for! Fast forward a year and I receive good news from Anna Marie & Lee that they’re pregnant. I nearly fell out of my chair and was dying to do a maternity photo shoot with them. Except, because I knew that they’re both very adventurous – I suggested us having some fun with their maternity portraits. 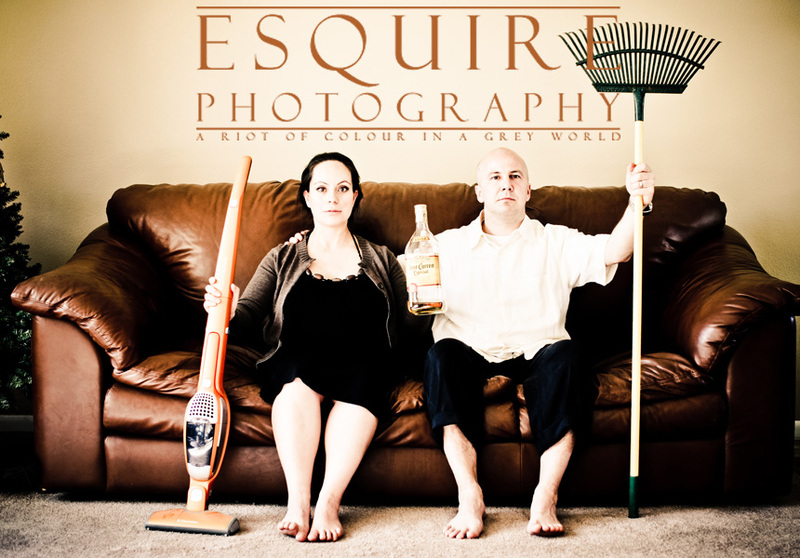 Quite plainly, I thought a spoof maternity portrait shoot would be fun. 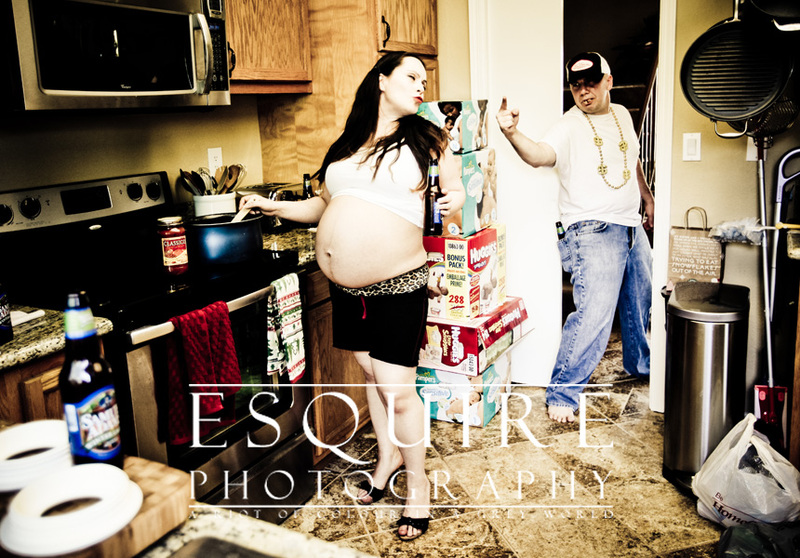 My creative juices were flying around at thought speed & said; “How about a white trash maternity shoot.” They both loved the idea & we scheduled a date on the calendar for their maternity shoot. So yesterday Anna Marie & Lee gave me a blank check with my creativity and it was awesome. Instead of doing the more cliche maternity portraits, I did a collection of more commercial/fine art inspired portraits with them. It was a perfect combination for their maternity shoot too. The romantic fine art portraits and the white trash spoof portraits. Before you check out Anna Marie & Lee’s fine art and white trash maternity shoot that we did at their home in Anaheim Hills and you’re thinking to yourself… Hey – I’d really like to get to know this Huntington Beach Wedding Photographer in Orange County loves to capture romantic portraits, timeless moments and have some really out of the box fun with portraits, then feel free to get in touch with me anytime. So without further ado, here are a few of my favourite portraits from their fine art/white trash maternity shoot that I put together & a movie that I shot on for them as well. I hope you’re having a great extended weekend – cheers! PS, Stay tuned for some more delicious wedding photography, news and another episode of How To Make The Most Out Of Your Wedding Day next Monday – cheers!